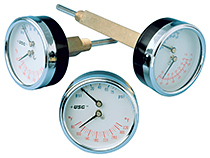 The Model 1088 boiler gauge are specially constructed with a brass connections and movements to withstand conditions inherent in residential hot water heating systems. Their low cost and reliable performance also make them a viable choice for a wide range of other applications. With the dual pressure and temperature dials, the 1088 can replace a pressure gauge and a temperature indicator. And the Model 1088’s modest 2½” gauge size is ideal for installations where mounting space is limited.